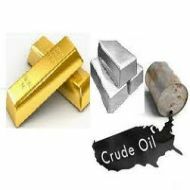 At 11:43 hours IST, MCX GOLD August contract was trading at Rs 26121 per 10 gram, down Rs 438, or 1.65 percent. 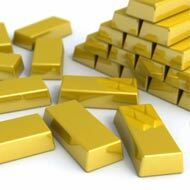 The GOLD rate touched an intraday high of Rs 26535 and an intraday low of Rs 26026. So far 11057 contracts have been traded. GOLD prices have moved down Rs 6106, or 18.95 percent in the August series so far. MCX GOLD October contract was trading at Rs 26252 down Rs 443, or 1.66 percent. The GOLD rate touched an intraday high of Rs 26650 and an intraday low of Rs 26158. So far 474 contracts have been traded. GOLD prices have moved down Rs 5598, or 17.58 percent in the October series so far. MCX GOLD December contract was trading at Rs 26387 down Rs 507, or 1.89 percent. 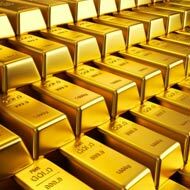 The GOLD rate touched an intraday high of Rs 26459 and an intraday low of Rs 26342. So far 34 contracts have been traded. GOLD prices have moved down Rs 4553, or 14.72 percent in the December series so far. 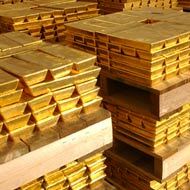 Gold edged higher on Tuesday as the dollar weakened after two top Federal Reserve officials downplayed an imminent end to monetary stimulus. Bullion is still down more than 7 percent since the start of last week due to worries over an early end to the Fed’s USD 85 billion monthly bond purchases and a cash crunch in China. 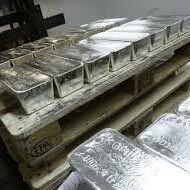 * Spot gold rose 0.2 percent to USD 1,283.55 an ounce by 0018 GMT. It fell around 1 percent on Monday, extending last week’s 7 percent slide as fears of a cash crunch in China spooked investors, and a slide in US equities prompted bullion selling to cover margin calls. * Comex gold rose USD 6 to $1,283.10. * Last Wednesday, Federal Reserve Chairman Ben Bernanke gave his most explicit signal yet that the US central bank was considering scaling back its USD 85 billion per month of Treasuries and mortgage-backed debt purchases. * On Monday, Minneapolis Fed President Narayana Kocherlakota said investors were wrong to view the central bank as having become more keen to tighten policy than it was before last week’s policy meeting. * Dallas Fed President Richard Fisher said even if the bank dialled back stimulus this year, it will still be running an accommodative policy. * Fears of a credit crunch in China’s banking system eased on Monday as short-term interest rates fell. The central bank said there were sufficient funds in the market but banks needed to improve cash management and control lending. *India’s biggest jewellers’ association has asked its members to stop selling gold bars and coins, about 35 percent of their business, adding to government efforts to cut gold imports and stem a swelling current account deficit. * HSBC lowered its 2013 gold price forecast to USD 1,396 from USD 1,542 an ounce and its 2014 price to USD 1,435 from USD 1,600, mainly on the Fed’s plans to reduce economic stimulus and weak Chinese growth prospects. * SPDR Gold Trust, the world’s largest gold-backed exchange-traded fund, said its holdings fell 0.43 percent to 985.73 tonnes on Monday – its lowest in over four years.